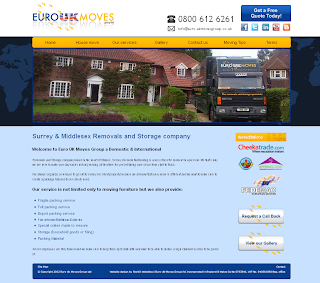 Our website of the week this week goes to Euro UK Moves Group Ltd on the basis of their flattering redesign and complimentary mobile site. Google recently discovered that eight million people in the UK access the Internet from their smartphone every day and as 7 in 10 People in the UK now own a smartphone, it’s become more important than ever to talk about the business potential a mobile site could bring to your company. 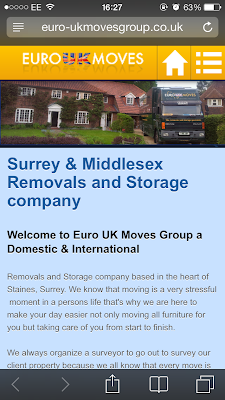 Euro UK Moves Group Ltd are a removals and storage company based in the heart of Staines, Surrey. They aim to not only move all your furniture for you but also take care of you from start to finish. On the whole, they understand that every move is different and want to make sure to create a package tailored to each individual client’s need. With this as their philosophy, a multi-device website was one of their main objectives during the site’s redesign. By having a mobile site, Euro UK Moves Group Ltd has ensured that the viewing of euro-ukmovesgroup.co.uk is as interactive as possible across any device their clients might potentially use to seek out their services - each varying in screen size and performance capability. The mobile site was custom-designed by our own Team at Toolkit Websites to support the branding of the existing website. You can see a recognizable gold bar at the top in both versions as well as the same header animation which appears to change even in mobile phone browsers due to the mobile-friendly technology we use. When you first visit the mobile site, you are at the outset greeted by a thumb-friendly menu. This makes navigation of the site on a small screen pleasing and convenient for anyone out and about or on the go. The text is also displayed much larger than on the desktop version of the site so there is no need for the user to be constantly zooming in and out to navigate and overall is more suited to the more portrait shape of a mobile screen. Mobile sites are also easy to update using The Toolkit as any changes made on the desktop version will automatically update the mobile version too!